A round of golf? A nice meal al fresco (assuming the weather’s nice)? Maybe a concert? What if we told you that if you took just five minutes tomorrow afternoon — before the weekend begins — you could enjoy all your weekend activities as usual, but by Monday morning you’d be thousands of dollars richer? “There’s a market anomaly that happens on the weekends, every weekend,” says our penny stock guru Tim Sykes. We’ve told you about Tim now and then since he came aboard with us this year. In 1999, when he was still in high school, he took $12,415 of gifts from his bar mitzvah and started day trading. By the time he graduated from Tulane, he’d amassed a $2 million fortune. Impressive enough, but even more so when you realize he pulled off this feat during the dot-com meltdown of 2000–2002. Considering the turmoil in the market right now, that makes Tim’s strategies even more appealing, no? “This happens in every single sector in the market,” Tim goes on. Trades like this happen all the time. We told you about a couple of them earlier this week — like the shipping stock that traded for $1.10 a share on Friday and jumped to $1.64 first thing Monday morning. A $1,000 stake on Friday becomes $1,490 on Monday morning. Which spotlights an important point — these aren’t options trades. We’re talking straight-up stock trades. So you don’t need to jump through the hoops of getting authorization from your broker to place Tim’s trades. Curious? Tim demonstrates the strategy as soon as you click this link. Don’t wait: After all, tomorrow’s Friday and you could be pocketing some of those “sweet profits” come Monday morning. Tim’s reply: “I don’t like working with a few rich, elitist snobs. I ran a hedge fund. I don’t get along with these ridiculously rich people. I barely own a suit and tie. And for you, fulfillment is ultimately what these trades are all about: “To live a very good life,” says Tim… “And really focus on freedom and doing what you love… That’s the dream, you know? So check out the strategy right now. You can put it to work as early as tomorrow. “The market looks downright ugly,” says our chart-watcher Greg Guenthner. “Yesterday’s bounce attempt fizzled shortly after lunch as the major averages sunk deep into the red. The Dow Jones industrial average coughed up more than 160 points and closed the day at its lows.” The Big Board slipped another 100 points on the open this morning, although at last check it’s recovered most of that loss. The drugstore stocks are losers this morning after word that Amazon is buying an online druggist called PillPack. CVS and Walgreens are both down about 9%. The big economic number of the day is the Commerce Department’s final guess at first-quarter GDP — annualized growth of 2%, less than expected, but still better than the first quarters of 2017 and 2016. It was a decent quarter for business investment, not so hot for consumer spending. The second quarter is shaping up better. Ugh — gold is only $10 or so away from a critical threshold. The bid is now $1,250. Gold has exhibited an interesting pattern since it put in a long-term bottom around $1,050. That was in mid-December 2015, around the time the Federal Reserve raised interest rates for the first time since squashing them to near zero during the Panic of 2008. 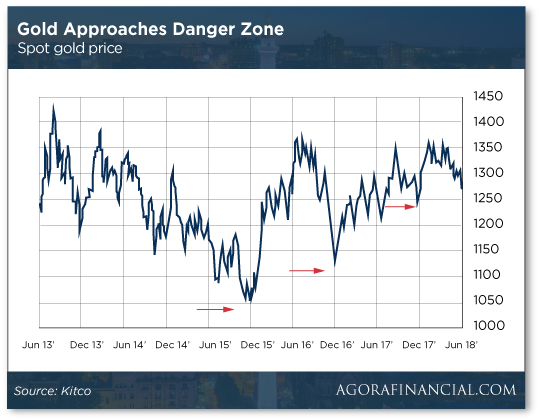 The Midas metal repeated this pattern a year later in 2016… and a year after that in 2017… putting in a meaningful bottom that coincided with a Fed rate increase. But the bottom last year was around $1,240… and gold is in danger of breaching it now. Much of gold’s drop in recent weeks has been driven by the dollar’s rise. The dollar index is up to a one-year high of 95. Yikes, oil is up another 1% today, and this time there’s no obvious news. A barrel of West Texas Intermediate is up to $73.44. We’re getting ever closer to a point where the oil price will have tripled in a little over two years — an event that often helps trigger a recession a few months down the line. Later today President Trump and Wisconsin Gov. Scott Walker will take part in a $4.5 billion photo op, courtesy of Badger State taxpayers. Not that it’ll be reported on TV like that. No, it’ll be a groundbreaking ceremony touting 13,000 new jobs. Foxconn, the Taiwanese electronics giant, will build a factory in Racine County making TV and computer screens. A year ago, when the plant was first announced, we took note that Foxconn was lured with $3 billion in state and local “incentives.” By last January, the tab has swelled by 50%, to $4.5 billion — according to a memo from the nonpartisan Legislative Fiscal Bureau. That’s more than $346,000 per job. But no worries: The state’s supposed to break even by — drumroll, please — 2043. Then there are the people whose homes and land are being stolen so the Foxconn photo op can happen today. Earlier this month the Mount Pleasant Village Board declared 2,800 acres of farmland and several dozen homes as a “blighted” area — all so the property can be seized for this boondoggle. “Besides the commonly understood definitions of blight — dilapidated housing, overcrowding, high crime — [state law] says an area can be deemed blighted if it is predominantly open and, for any reason, ‘substantially impairs or arrests the sound growth of the community,’” according to the Milwaukee Journal Sentinel. The state can get away with that twisted reasoning thanks to the U.S. Supreme Court’s horrible Kelo ruling in 2005. Under Kelo, the Fifth Amendment’s takings clause applies not just to public works like roads or dams, but basically any scheme in which corporations and developers are conniving with city fathers to line their pockets and your property happens to stand in the way. The land in New London, Connecticut, was seized for a Pfizer pharmaceutical factory — which was never built. The decisive vote in that 5-4 decision was the now-retiring Anthony Kennedy. The current occupant of the White House approved heartily: “I happen to agree with it 100%,” he told Fox News’ Neil Cavuto in 2005. The Kelo case was turned into a movie last year called Little Pink House. Given its timeliness, I’d watch it with my wife this weekend, but it appears the home video release isn’t for a few more weeks. “A further comment,” a reader asks for our indulgence, “on the ‘deregulation’ of financial services by Bill Clinton and the right wing. “I’m not sure of any role by Barney Frank in this particular boondoggle, but I do know that this was the child of Sen. Phil Gramm (R-Texas) — another Ph.D. economist who ‘knew what he was doing’ — and his Republican followers. “My understanding is that it was more Treasury Secretary Robert Rubin’s advice that led Clinton to go ahead and sign. But I’ll agree that Larry Summers is an a**hole. “When people complain about NAFTA and financial deregulation, they forget that this all happened post-1994 and the Gingrich/Republican takeover of the House. There were earlier attempts, but none of them made it out of the prior Democratic majorities in the House. “Glass-Steagall repeal was just another result of the Reagan Revolution and Middle America voting for those who would wreck their middle-class lives. “And now that the Repubs have even more power, let’s not forget to thank Art Laffer for the last 30 years of massive budget surpluses (sic). Fake news, anyone?? “A Big Thanks to the Repubs and Bill Clinton for caving to Big Business and Big Banks. “There IS a difference between today’s fascism and that of the ’30s — back then, governments forced compliance by their corporate partners at the barrel of a gun. “In today’s model, corporations/money are in the control room and (Repub) government is committing hara kiri at their behest. “You wanna know where the writers of Into the Badlands get their material?? “As always, what would The 5 be without the social/political commentary? The 5: Good point, especially about the contrast between now and FDR’s time. Can you imagine any scenario nowadays like the one with Sewell Avery, chairman of the Montgomery Ward department store chain? Avery did constant battle with FDR’s National War Labor Board. As Wikipedia recounts, “He resisted signing a contract after a union had won representation for 7,000 of Montgomery Ward’s employees until twice ordered by Roosevelt. When Avery refused to settle a strike in 1944, endangering the delivery of essential goods, Roosevelt’s administration used emergency measures to remove him from office and temporarily seize the company; in April 1944 two National Guard men had to pick him up by an arm each and carry him out of his office. P.S. Don’t miss the rebroadcast of Tim Sykes’ brand-new strategy for making money on the weekends… with little effort. You’re in on Friday. You’re out on Monday. Hard to believe, right? Well, tomorrow’s Friday… and Tim’s all set with his first trade, exclusively for readers like you. Check it out right here.